Over the years, the Group 1 1000 Guineas at Riccarton has been a very successful race for Waikato Stud and their stallions. Former champion Sire O’Reilly won the race twice with Final Destination in 2001 and The Jewel the following year, the WS bred and owned No Excuse Needed filly Daffodil was successful in 2008. Top class Pins filly Katie Lee became the first and only to complete the 1000 – 2000 Guineas double when winning in 2009 while just last year the WS bred Savabeel filly Hasahalo proved too strong for Stephen McKee and Albert Bosma’s Go Racing Syndicate. In this addition of A Trip Down Memory Lane, I wish to delve into the careers of two fillies that for different reasons were close to my heart – Final Destination and Katie Lee. Moving to New Zealand from Australia (via England) in August 2000, I only knew three people – Greg Lindsay who I went to Marcus Oldham College with a couple of years earlier along with Wayne and Vanessa Hillis who I met when Wayne came over to Aussie and worked for Peter Hayes at Flemington. Quickly finding out that the Hillis’ were managing Hinuera Lodge for legendary Veterinarian Jim Marks on the outskirts of Matamata, I met up with them and they told me about a nice 2YO filly they had by O’Reilly. Obviously, with me working for Waikato Stud, I took particular interest in this filly, who was from O’Reilly’s first crop. She had three trials before making her debut – she was due to have more but had a very bad habit of playing up in the truck heading to the track of a morning or the trials. One day someone quipped, we just want to get her to her final destination, hence her name. Making her debut locally at Matamata, she ran a very encouraging second to Copper Mountain, who was part-owned by Hillis’ employer Jim Marks. Wayne Hillis stepped her up to Group class for her next start, again running second, this time to future Group 1 winner San Luis in the Group 3 Ford 2YO Classic at New Plymouth. Given a break, she returned to the track with a third placing, albeit beaten over nine lengths on a very heavy track at Avondale. She had a month between runs before getting a better track at Ruakaka finishing fourth, beaten by under two lengths. Following this run, she was set for a 3YO race on the last day of the Hawke’s Bay Carnival, again finishing second, this time to another future Group 1 winner Master Belt. Gary Grylls who had been on all her runs except at New Plymouth was replaced by Opie Bosson for her next start, the Group 3 Desert Gold Stakes, that year ran in October. Hitting a heavy track, which she disliked, she was well beaten into fourth. At this stage, she had had six starts for three seconds, a third and two fourths. Despite still being a maiden, Hillis was adamant that she was up to the class of the 1000 Guineas and the decision was made to push on to this race. Being the outsider of the 15 horse field and with Opie on the favourite Flying Babe, Gary Grylls to his credit was happy to go back aboard. Although better, she was still a bit volatile in the truck and to go to the 1000 Guineas, she also had to go on the ferry across the Cook Strait. Arranging a transport company to take her to Christchurch, she handled the travel extremely well and went into the race in great order. From barrier seven, Grylls allowed her to settled about midfield in the 1600m feature. Still travelling strongly to the turn, once getting into the clear she charged home to win quite convincingly. Needless to say, the house back at Hinura Lodge erupted into a frenzy and Vanessa Hillis, who had joined in a training partnership with Wayne only two days earlier jokingly pointed out it was her influence which brought about the success. I was fairly happy myself, having $10 each way on her and from memory, she paid about $86 the win and roughly $15 the place… it was a big night! Now a Group 1 winner against the girls, she was set to take on the boys in the Group 1 Bayer Classic at Otaki just under three weeks later. There was no $86 this time, starting second favourite behind another O’Reilly filly Spring. Proving the 1000 Guineas was no fluke, Final Destination again proved too good for her opposition, winning by two lengths. By now she was regarded as one of the best three-year-olds in the country and substantial overseas offers were being tabled. She was scratched on race morning of the Group 2 Eight Carat Classic on Boxing Day as it was believed she had been sold. However, the money never came through and she was given a break with an eye on an Autumn campaign. Resuming in early March, she defeated the older mares, including fellow 1000 Guineas winner Elevenses at Ellerslie. Again another offer came in for her and she was sold to America, heading to the stable of Hall Of Fame trainer Bobby Frankel. She had three starts for two wins, one of which was a Group 2. She was retired to Japan, producing six winners from as many foals including a Group 3 winner by Deep Impact. During my ten years in New Zealand I formed many great friendships, none stronger than Mark and Denny Baker of Hallmark Stud so you can understand my satisfaction when Katie Lee completed the Guineas double at Riccarton in 2009. This story starts many years before with Denny Baker’s faith in her family going right back to her great-grandmother Estella Dawn. A friend of his Lance Wallace didn’t know what to do with her so with Denny liking her pedigree, together they decided to breed her to Denny’s resident stallion Bletchencore. The resultant foal was a filly which was to be named Miss Distinction. Born with an ‘offset’ knee she was never a sales proposition so Denny along with his son Mark broke her in and gave her to Don Couchman. Winning one race she returned to Hallmark Stud and was given to Taranaki dairy farmer Trevor Hurley and his then-wife Delma. The only condition was she had to go to a Hallmark stallion. Hurley sent her to Spectacularphantom with the resultant foal being a grey filly. Under the Hallmark banner, she went off to the sale at Karaka with a $1500 reserve. She failed to get a bid so after consultation, Delma told Trevor that they would race her. Named Miss Jessie Jay, she ended up being a very good mare winning nine races (including a Group 3) and over $150,000. When going to stud, the agreement was that Trevor and the Bakers would breed her together with the latter responsible for the service fees. In 2005 they decided to send her to Pins, who was flying through the deeds of El Segundo etc and on October 18 2006, Miss Jessie Jay foaled a filly in Australia, as she was heading to Oratorio that year. Brought back to New Zealand, the Pins filly was an absolute cracker and at the 2008 Karaka Sales, she lit up the sales ring, eventually being sold to Sir Patrick Hogan for $340,000. Given to Graeme Rogerson, she would race as Katie Lee. 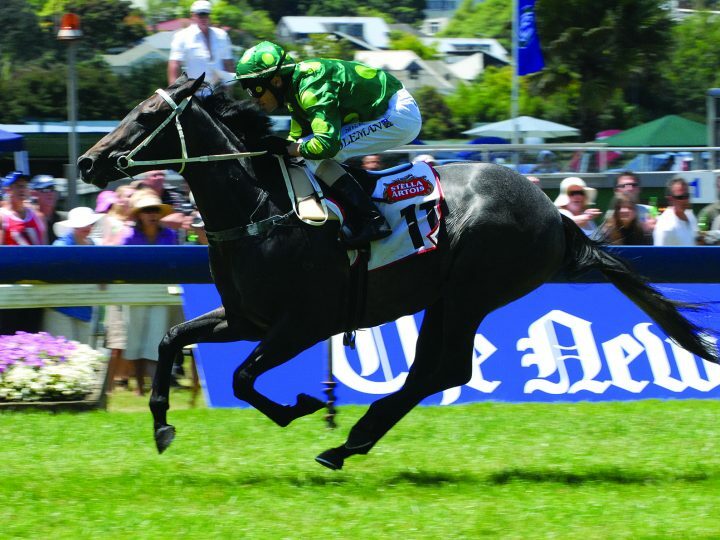 She had a very busy 2YO year, having six starts with the highlight being a win in the Group 2 Eclipse Stakes at Ellerslie on New Years Day in 2009. On the back of this impressive victory, she started favourite in the $1 million Karaka Million but didn’t have the best of luck, finishing out the money. Following a spell, she returned in the Group 3 Gold Trail Stakes on the middle day of the Hawke’s Bay Carnival, finishing third before returning to the winner’s list when beating the boys in the Listed James & Annie Sarten Memorial at Te Rapa. This win gave her connections the confidence to again take on the colts in the $1 million Group 1 2000 Guineas. With Opie Bosson in the saddle, she settled around midfield before barging her way early in the straight, charging home to win by a length. Backing up a week later, she was out to create her own bit of history – to be the first horse to win both Guineas. In a slowly run race, she didn’t have everything her own way and halfway down the straight she looked a forlorn hope. However, she wasn’t to be denied, getting up in the last couple of strides to beat the future Oaks winner Keep The Peace. Brought back to the North Island she was given a month between runs, heading to Awapuni and running second in the Group 3 Eulogy Stakes before winning the Group 2 Eight Carat Classic as an odds-on favourite on Boxing Day. Backing up a week later and stepping to 2000m for the first time, she tried gallantly but just couldn’t peg back Adaline, whom she had defeated a week earlier. Her campaign wasn’t finished yet though! Given a month freshen up, she finished third to Keep The Peace in the Group 3 Desert Gold Stakes before stepping back up to 2000m and winning the Group 2 Sir Tristram Classic at Te Rapa. At this point, it was decided that she would take on the boys in the $2.2 million New Zealand Derby but things didn’t pan out right for her on the day and she finished towards the rear of the field. Named NZ Champion 3YO she carried on racing as a four-year-old and although still winning at Group 3 level, she wasn’t quite the same and she was retired to stud. How things have changed – her family is now one of the most sought after in the NZ Studbook with her yearling colt by Savabeel top this year’s Karaka Sale, being sold to David Ellis for $1,025,000…. a long way from Miss Jessie Jay failing to get a bid 20 years earlier.